This Angel's Gate Lighthouse ornament by Purple Palm Needlepoint Designs is one of a series of 48 lighthouses. The Californian lighthouse ornament measures 4" in diameter. 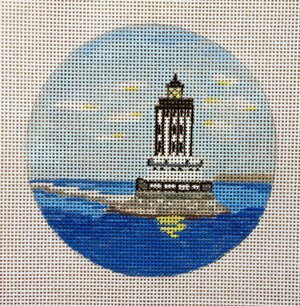 The Angel's Gate Lighthouse ornament is handpainted onto 18 mesh mono needlepoint canvas.